Book three of this series adds on to the search for Glendower with the search for Blu's mother. We've got even more characters, some caves, and a bit of bonding with the characters. Some questions get answered and the waters get muddied. I enjoyed this installment a bit better than the last. There weren't as many mysteries and a bookstagrammer really prompted me to look harder at the characters. I could appreciate their relationships and interactions with each other. I think looking at it with that lens allowed me to enjoy the book more. But to be clear, I don't care anything about Glendower or Cadeswater at this point. I've lost interest. 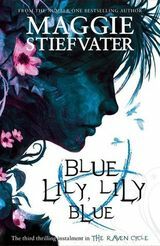 I like the attention to detail from Ms. Steifvater and the characters, even the minor ones, are truly so well-developed. This was a pretty good read. If I liked this series a bit more, I'd switch to the book instead of the audio. Mr. Patton continues to a great job giving a different clear voice to each character and by this time, there are a ton of characters. I just don't care for him as a narrator. It's just a personal preference, I guess. If I just focus on the characters, I enjoy this series a lot more. I don't really care much about the plot.